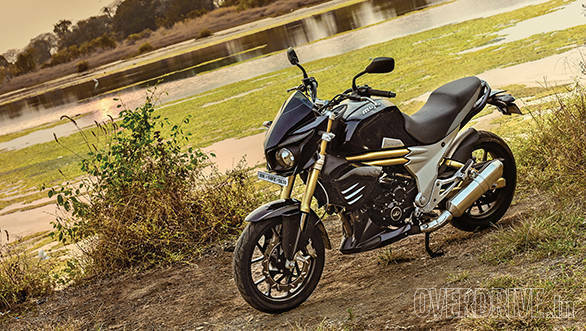 The Mahindra Mojo has been described as many things  a long distance tourer, a big roadster, a gentle naked, but in truth the machine is nothing but a show of strength. Here's Mahindra saying that this is what they're capable of  'we can build good motorcycles.' After some days with the Mojo, I am compelled to agree, they've indeed built a good motorcycle with a unique personality. I won't go into much detail about how it looks because you've probably read all about it. Instead, I'll tell you that while I didn't really like it at first, the design has grown on me considerably. I don't mind the face so much anymore and I'm quite fond of the slim tail. The Mojo looks really big and attracts a lot of attention from people who think it's a big bike thanks to the twin exhausts, which by the way are neatly integrated and don't become a hindrance in traffic. Build quality is quite good and the Mojo uses some high quality feeling parts. I showed the hefty 182kg machine no respite over bad roads and speed breakers but there wasn't a rattle or squeak to be heard. Finish levels are also quite good but on a closer glance there are a few things that stick out, like the gaskets that are visible where the head meets the block or the rough finish inside the cut outs of the front disc brake. The silver finish above the footpegs is a bad idea because it's already scuffed and blackened from contact with my boots and looks messy. These are but a handful of tiny niggles on an otherwise well finished product. The Mojo's 295cc engine is one of the nicest parts of the motorcycle. The 27PS motor is quite rev happy, despite redlining at a relatively low 8,500rpm. But it makes so much torque through the rev range, you'll rarely need to rev it so high. 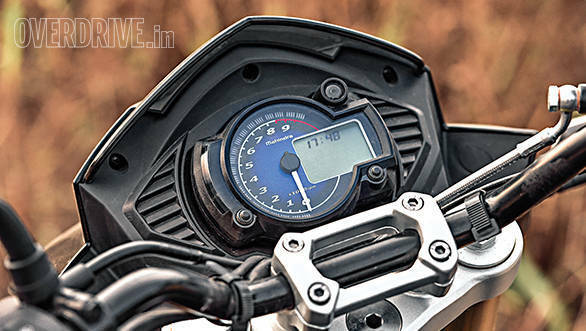 The engine gets a bit grumbly below 2,500rpm but the ratios have been spread well to ensure good rideability. It's not as short geared and flexible as a KTM 200 Duke but doesn't feel excessively tall geared either. Performance is impressive for such a heavy motorcycle. We recorded an 8.6s run from 0-100kmph and a top speed of 142kmph at which point the speedo was reading out 150kmph. Such high speeds get quite buzzy but the Mojo can settle into a comfortable 115-120kmph cruise. 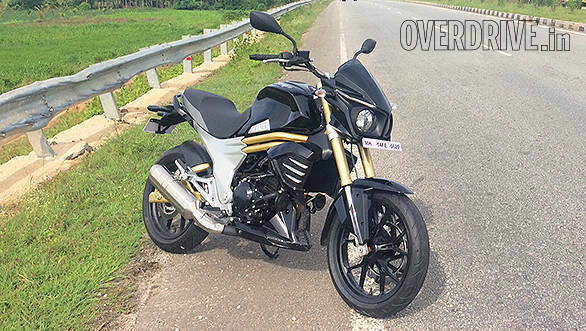 It is reasonably efficient for its power and weight, returning an overall 28.6kmpl which is just a little lower than the KTM 200 Duke. 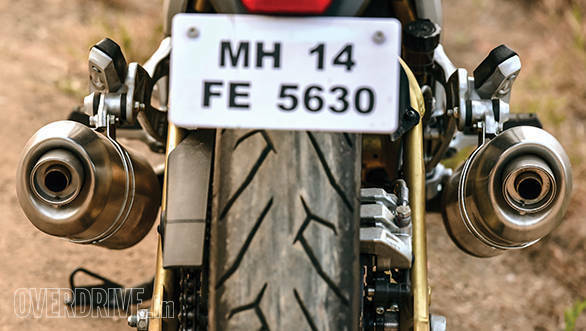 But performance isn't the Mojo's only strong point  there's also the sound to go with it The sole reason Mahindra retained the twin exhausts from the concept bike was so they could engineer a unique exhaust note. It's a loud motorcycle and sounds reminiscent of a twin cylinder like a V-Strom or Inazuma at certain points in the rev range. Rolling off the throttle from high revs produces a series of entertaining burbles and pops from the pipes. This is easily the best sounding single on sale today. Mahindra say the Mojo can be louder still by removing the baffles in the twin pipes, something we intend doing with our longterm bike. The Mojo has a beautifully plush suspension that swallows up almost anything you throw at it. The motorcycle feels large at all times and it takes a bit of effort at the bars to get the thing turning. Hoping onto a 200 Duke after riding the Mojo was a huge change with the KTM feeling tiny in comparison. The Mojo definitely prefers long sweeping corners over tight switchbacks where the exhaust heat shields touch down at anything above moderate lean angles. With a moderately heavy pillion on board, the bike can scrape even while leaned over for a u-turn. A couple of clicks of rear suspension preload will definitely help this. The sticky Pirelli tyres are really welcome and you can feel them helping the chassis which tends to get disturbed by mid corner bumps. I put office tall man Lijo on the back seat and aside from his knees serving as arm rests for me, he was pretty comfortable on a 20 minute ride, saying he found the seat usable and grab rails easy to hold on to. 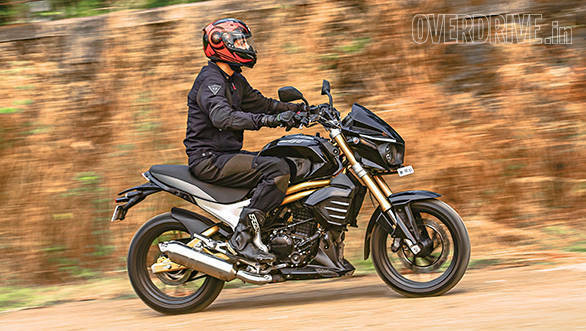 Dynamically, you get the sense that the Mojo could be so much more if it shed some weight and had better cornering clearance but there's not much you can do about either without drastic modifications. The Mojo occupies a niche in the market. It's the only 300cc single available today and its Rs 1.65 lakh ex-Mumbai (Rs 1.63 lakh ex-Delhi) price is right between the 200 and 390 KTMs. When BMW's G 310 R arrives, it'll be priced significantly higher and won't really compete with the Mojo either. The Mojo is a fast but calm motorcycle and a very likeable one at that, if you're not the type who lives on rubber's edge. It feels built to last and is a proper attention grabber. I doubt it will be a runaway success, Mahindra is still too young a company for that but I'm sure that those who buy it for what it is will be happy customers.